Push Your Luck Podcast: Council of Verona: where's that poison when you need it? Council of Verona: where's that poison when you need it? Another light game in the series of micro games (small box with minimal components), Council of Verona will be released in an upcoming Kickstarter by Crash Games. 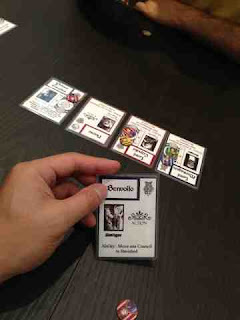 ﻿In this game, players are trying to strategically play the cards in their hand (total of only 13 in the game) to manipulate 2 areas, the council and the banished and to decide where to place their influence tokens so that when the game ends, those cards where they have influence tokens on will qualify for scoring and they will score maximum points. The player with the most points will win the game. At the start of the game, players will receive 1 card and then draft the remaining 2 (this is for 4 players). Then the game begins and players will have to play 1 card and then decide to activate the action and/or place one of their tokens on any cards that allow them to on the playing area. Once all cards have been played from their hands, the game ends. There are 2 types of cards in the game and cards belong to 3 parties; Capulets, Montagues and Neutrals. First type of cards are action cards which do not provide any points directly but will provide some type of action which manipulate the Council and Banished areas. The second type of cards are victory cards which has 3 spots for players to place their influence tokens on and will only allow scoring IF the condition they have is fulfilled. An example will be "if there are more people in the Council than Banished". When the game ends, players will check each victory card and see if it scores. Then players will flip over all tokens (max 3) that are placed on those cards and see how many points the token's owners will score. Each victory card also has modifiers to the tokens placed which can be positive or negative depending on the card. What did I (and my friends in my gaming groups) think about this game? As you can tell by now, the game is quite a fast game and seemingly light and will reward players who have played it several times. However none of us have the impertus to play this game several times because after our first 2 plays of the gamewe did not "feel" it. The groups I play with while more used to playing heavier games do enjoy light fillers like Love Letter and Coup but this game just did not draw us in after our sessions. One of the gripes we can put our finger on was the last player advantage. This doesn't mean that the last player will always win, it just means that the scales are tipped quite a lot to the last player. While we can negate this by ensuring the cards we draft do not give the last player too much advantage and also knowing all the cards there is, the last player often can grab at least 1 card which can really screw the victory conditions of several victory cards and thereby causing the round to be very low scoring. I guess multiple plays will provide the experience the group needs to know what cards to draft to guard against this. Another smaller gripe we had was we weren't really sure what we were drafting for at the beginning of the round. Now this is quite common for a lot of games and with more plays we will probably know what to look out for. Indeed for Love Letter we had the same thing but it was fun for us and we quickly got into the groove of things and knew what to do for Love Letter. For Council of Verona though, we all did not feel a need to play another round. One final thought is that I found myself just trying to put my tokens on those with 0 or positive modifiers just hoping that I got lucky and manage to have some score. Most of the games we have so far are very low scoring due to how well we guard and block each other and it felt somewhat anticlimatic when we reveal our tokens at the end. While I hope that with more plays the perceived depth of the game will reveal itself, I haven't found anyone so far that wants to play it again after their first plays. Now I have read the reviews online and all the wonderful posts on twitter and even podcasts that talk about how wonderful this game is and all, somehow for me and my friends, we just don't see it. I am not too sure what I am missing here but with the multitude of micro games out there (and the recent ones that I have been playing), this just doesn't work for me. Perhaps if the game last several rounds (i.e. every player gets to be starting player once) that may allow players to play a few more rounds in 1 game AND balance out the last player advantage. The other micro games that I have played recently seems to be able to provide the fun for me proportional to the perceived weight and depth of the game and yet for Council of Verona it did not. As a side note, the theme of this game is ok but not very immersive. Indeed its the same for most micro games due to the length and weight of the game, you probably can't get a lot of meat for the theme to make a very big impact. Art wise though I have seen the images released on BGG and its quite good. Its the style of art that I like and enjoy. Hopefully you get to try it first and be able to judge for yourself what you think about it but for me and my group, its an unfortunate miss.